This dish is a favorite among my guests 🙂 It’s pretty quick and easy to make too. Heat oil in a large heavy-based pan over a medium heat. Add shallots and cook for 3 minutes or until soft. Add garlic, chillie, ginger, galangal, and lemongrass and cook for 1 – 2 minutes or until aromatic. Stir in coconut milk, stock and water, bring to simmer and cook for 10 minutes to infuse flavours. Add lime leaves, cod, fish sauce, lime juice and sugar. Stir until well combined and simmer for 5 minutes or until fish is cooked through. Ladle into bowls and top with spinach. 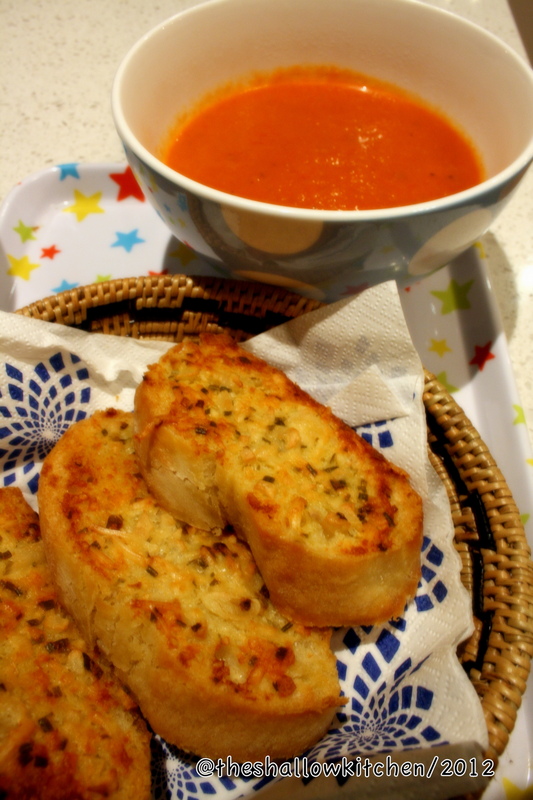 My old dear friend Agnes from college gave me this recipe when I moved to live in Australia with my husband. At that time, I was zero in cooking knowledge. In her recipe she says, boil the oxtail until tender. I didn’t have a clue that tender in here means it will take about 1 – 1.5 hour to cook. So after couple minutes I declared my buntut is cooked. And…it turned out still hard and uneatable! So….remember it need to be boiled about an hour or so, check occasionally with knife/fork, or until you can see the bones almost separated from the meats. 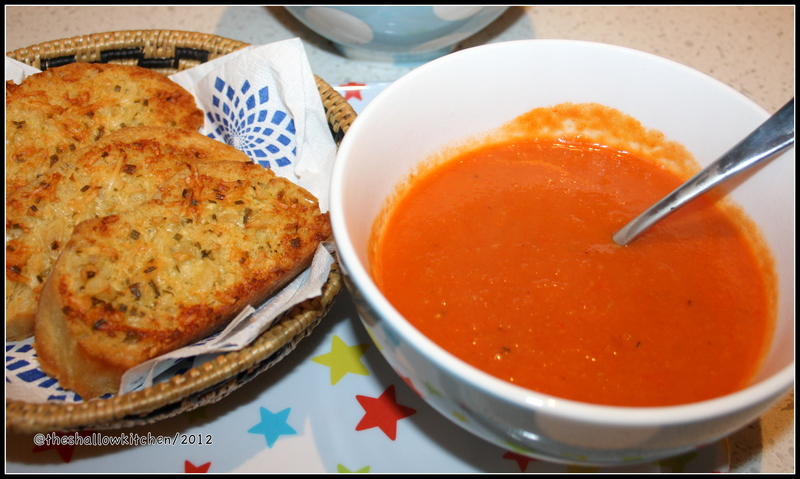 It’s easy to make, warm your tummy in the winter, quite light too for summer evening. Boil the oxtail until tender, it will take about 1 until 1.5 hour. If the water runs out, add more water. Once the oxtail is soft, add salt, pepper, nutmeg, cloves, carrot. Cook for about another 15 minutes or until the carrot is tender. Add the tomato/potatoe and spring onions, cook for another 10 minutes or so. Serve with fried onion on the top. Being Indonesian, I can’t not like bakso. Bakso or meatballs in English, made from beef mince and eat it with egg noodles and vegetables. In Indonesia bakso is often sold in the street on little cart. In Australia you can find ready to eat bakso at the oriental supermarket, in frozen section. Not knowing what kind of chemicals and preservative the ready one that sold in the market, I try to make home-made bakso. My friend Aimee who lives in Dubai and expert in cooking Indonesian meal, gave me her bakso recipe and since then I always use this recipe. mixed all the ingredients above together, set aside for 15 minutes. then make a little ball one by one. boil beef bones in 2 liter water for about 1 hours. then add the bakso into the boiling soup and cook until the bakso is firm. serve with egg noodles, some green vegetables (bok choy/cut spring onion) couple boiled tofu, top with fried onions, and chilli sauce. Boil the chicken with 1 litre of water. When the chicken is cooked, put it aside, and shreded into pieces. 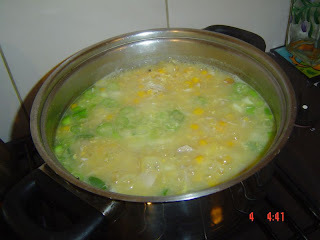 Put the shreded chicken back in the boiling water, add the cream corn, onion, sweet corn, chicken stock and egg. Stir. Let it cook for another 5 or 10 minutes. Add salt and peper and spring onion. 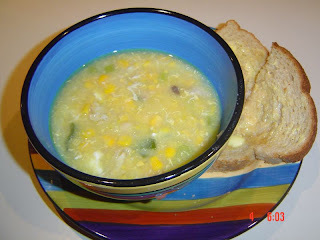 this soup is very easy to make and good in winter or cold night. cook pumpkin, potatoes and onion with a butter until pumpkin is bit tender, then pour a chicken stock, simmer for 10 minutes or until pumpkin and potatoes are soft. process with food processor. serve with cream. add pasta to a large pan of rapidly boiling water and cook until just tender, drain.while pasta is cooking, melt butter in medium pan, add onion and garlic. stir over low heat for 3 min or until tender. add flour and stir for 1 min. combine mil, cream and lemon juice in a jug. add gradually to onion mixture, stirring constantly. stir over medium heat for 3 min or until mixture boils and thickens. add salmon and parsley to pan; stir for 1 min or until heated through. turn hotplate off. add drained pasta to pan, stir until well combined. season with salt and pepper before serving. for a variation you can use canned tuna instead of salmon and add 1 teaspoon of mustard to sauce.